In the front row from left to right, Annette Werger, PNP, Brielle’s nurse practitioner; Tammy Laplante, Brielle’s mother, a PMC cyclist; Jaclyn Laplante, Brielle’s sister; Dr. Janeway, Brielle’s doctor; Ed Moses, Brielle’s uncle, a PMC cyclist; Marnie Salkovitz, RN, Brielle’s primary nurse; Bill Laplante, Brielle’s father, a PMC cyclist. In the back row from left to right, Peter Pessolano, a family friend and a PMC cyclist; Glen Witwer, a family friend and a PMC cyclist; Bob Lupacchino, a family friend and neighbor, a PMC cyclist; Paul Cicco, a family friend and neighbor, a PMC cyclist; Stu Ferm, a family friend and a PMC cyclist. Inspired by the courageous fight and love of a little girl from East Longmeadow, Mass., Team Brielle’s Brigade continues to turn a negative situation into a positive by riding in the Pan-Mass Challenge. The team’s PMC journey began nine years ago when Brielle LaPlante, then 4, was diagnosed with leukemia. Consequently, Brielle’s diagnosis motivated her uncle, Edward Moses, 47 of Hampden, Mass. to form Team Brielle’s Brigade, a group of 12 PMC cyclists representing the LaPlante’s friends, family and neighbors. Sadly on the eve of this year’s PMC ride, after surviving leukemia twice Brielle’s cancer resurfaced in the form of osteosarcoma, a type of bone cancer that spread to her lungs. In August 2012, Brielle, then 13, lost her battle to cancer. Each year, Team Brielle’s Brigade embarks on the 190-mile PMC route from Sturbridge to Provincetown. As a warm-up, each Friday before the official ride begins, the team cycles from Hillsdale, NY through East Longmeadow, Mass., Brielle’s hometown, and on to Sturbridge which adds nearly 90 miles to their total weekend ride. Prior to the PMC, the team hosts two annual fundraising events: Team Brielle’s Brigade Cocktail Party and Silent Auction in Springfield, Mass. and Carnival for a Cure in Wilbraham, Mass. The team’s goal is to raise as much money as possible to help pediatric cancer patients like Brielle. Since Team Brielle’s Brigade’s inception, the team has raised more than $788,600. On Friday, Dec. 7, Team Brielle’s Brigade presented a check for $188,600 to Dr. Katherine A. Janeway, the pediatric hematologist-oncologist at Dana-Farber Cancer Institute who treated Brielle. The money the team raised will go directly to support Dr. Janeway’s research for pediatric sarcoma, the disease that took Brielle’s life. The team is now gearing up for next year’s PMC ride. The 2013 PMC is set to take place on Aug. 3 and 4, 2013. For more information, visit Team Brielle’s Brigade’s website: www.briellesbrigade.com. 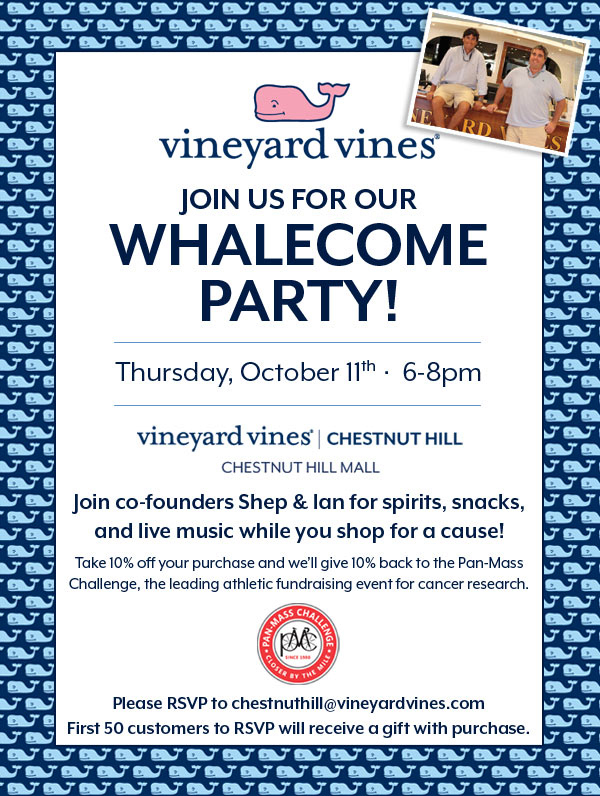 Come have a whale of a good time and celebrate the grand opening of Vineyard Vine’s newest store at Chestnut Hill Mall, while shopping for your favorite cause. Ten percent of all sales will directly benefit the Pan-Mass Challenge and an additional 10% will be taken off the total purchase. Attendants will have the opportunity to rub elbows with Vineyard Vines co-founders, Shep and Ian Murray, while enjoying spirits, hors d’oeuvres and live music. Tackle holiday shopping early, bulk up your fall wardrobe or come enjoy the festivities. All are welcome. The Whalecome Party will kick-off on Thursday, Oct. 11, from 6 to 8 p.m. at the Chestnut Hill Mall, 199 Boylston Street, second level between Ann Taylor and Banana Republic Women.